There are two main types of dental implants: endosteal and periosteal. Endosteal implants are designed to sit inside the jawbone and are almost exclusively used for all dental implant procedures. Subperiosteal implants sit over the jawbone just below the gum line. They are far less common, but may be the recommended choice is some cases. Dental implants are good for your bone health. If you have a missing tooth or teeth, there is no longer stimulation of the jawbone, which results in the bone being reabsorbed by the body. This causes your face to change shape and can also cause the surrounding teeth to be lost as well. Since dental implants are embedded into the jawbone, they properly stimulate the bone and prevent it from deteriorating. You may be a candidate for dental implants if you have severely damaged or decayed teeth, or if you are missing one or more teeth. You must also have adequate bone mass to support an implant. To find out for sure if you are a candidate for dental implants, schedule a consultation with Sunset Dental today! A dental implant is composed of three main parts, each with their own function. The first part, is the implant itself. The implant looks like a tiny titanium screw. The implant is placed into the jawbone and lies below the gum line. 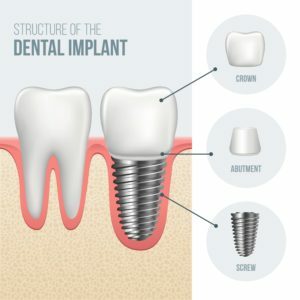 Attached to the implant is the abutment, which is responsible for connecting the dental prosthesis to the implant. The abutment is a small metal connector piece with attachments on either side. Finally, the dental prosthesis is the visible portion of the dental implant and is usually a dental crown or denture. A dental crown is used to replace a single tooth, while a denture is used to replace multiple missing teeth. How do dental implants compare to other restoration methods such as bridges or dentures? Dentures are removable and can slip out of place while eating and speaking. Dental implants, on the other hand, are fixed restorations. This means they cannot be removed from the mouth and will not slip while eating or speaking like dentures. Dental bridges can be either fixed or removable, depending on the type. Dental bridges can, however, cause damage to the teeth on either side of the missing tooth. Dental implants can replace a missing tooth without damaging the surrounding teeth. For these reasons, dental implants are the preferred choice over both dentures and dental bridges. What if I don’t have adequate bone mass to support an implant? Sometimes it is possible that you don’t have adequate bone mass to properly support a dental implant. This can happen as a result of the bone resorption caused by missing teeth or for various other reasons. Whatever the reason, there are a couple of things that can be done to build up your bone mass. A bone graft may help you build up enough bone mass to support a dental implant by using bone from your own body or manufactured bone material, to essentially grow new bone. During a bone graft, bone material is obtained and then implanted into an area that is lacking in bone. Within a few months, this bone material should grow into healthy bone that can support a dental implant. Depending on your individual case, a bone graft may be performed before or during the dental implant placement. If bone is lost from above the upper teeth, this can result in your sinus cavity drooping down and becoming too low to support a dental implant. In these cases, a sinus lift is required to build up enough bone so that a dental implant can be safely placed without damage to the sinus cavity. During sinus augmentation, the sinus floor is repositioned and bone material is added to stabilize the dental implant. In other cases, the bone under the sinus floor may simply be lifted and then bone material will be placed underneath to support the lift. What should I expect during the dental implant procedure? The placing of dental implants is considered a dental surgery. As such, you will be properly sedated and anesthetized to maintain your comfort. To place your dental implants, our dentists will make a small incision in your gums and drill out the socket where the implant is to go. 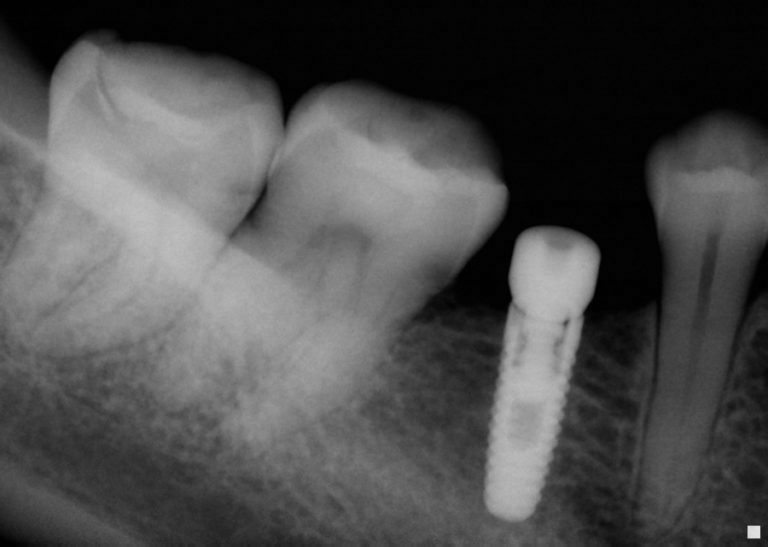 Once the socket has been properly shaped and prepared for the implant, the implant will be placed into the jawbone. The abutment will likely be screwed into the implant, and then the gums will be sutured up around the abutment. At this time, a temporary restoration may be placed as well. Once the dental implant has been placed, your bones will begin a process known as osseointegration. During this process, your bones will slowly harden around the dental implant, effectively locking it in place. Usually this process can take about 3-6 months, and in this time you will have to be careful not to disturb the implant. Once osseointegration has been completed, then your permanent restoration can be placed and the procedure is complete. 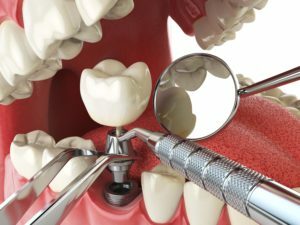 What should I expect after the dental implant procedure? After the initial placement of your dental implants, you can expect to feel sore for a few days following surgery. It is perfectly normal to experience minor swelling, pain, and even bleeding. Drs Amanda and Jerry Kronquist will provide you with post op instructions detailing how to manage pain, swelling, and bleeding after surgery. They may also prescribe you pain medication or antibiotics. It is important that you follow all of their post op instructions for the fastest recovery. What can I eat after the dental implant procedure? After the initial placement of your dental implants, you will need to make temporary diet modifications. Directly following surgery, it is recommended to eat cool, soft foods. It is also recommended that you avoid hot or warm foods as these can actually trigger bleeding. Instead wait until 2-3 days after surgery to begin eating warm foods. While you undergo osseointegration, you will want to eat soft foods so as to not exert too much pressure on your healing dental implants. 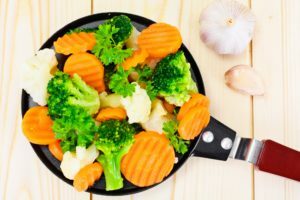 Foods such as pasta, fish, yogurt, eggs, pudding, steamed vegetables, applesauce, and soups are recommended. Eventually you can start working your way up to harder foods, but you should not do so until directed by our dentists. Eating hard foods too soon can cause your implants to shift, which can jeopardize the entire process. Dental implants are one of the longest-lasting restoration methods available and can last up to 20-30 years. However, the average lifespan of dental implants is approximately 10 years. To keep your dental implants in great shape, be sure to maintain good oral habits and visit Sunset Dental for regular dental checkups so we can help you maintain your implants. The cost of dental implants depends on a variety of factors like the type of implant, the tooth being treated, the extent of treatment, and the type of dental prosthesis. Typically, dental implants can cost anywhere from $3,000-$4,500 per tooth, however they require less maintenance and replacements than other restoration methods. If you have dental insurance, you may also be able to obtain some level of coverage for dental implants. To obtain your perfect smile in an anxiety-free environment, schedule a consultation with Dr. Jerry Kronquist and Dr. Amanda Rae Kronquist of Sunset Dental Group today. Sunset Dental Group serves Santa Ana and other central Orange County communities.